Cheapest price from Amazon, makes a nice Christmas gift. Around £99 from other sellers searching Google. Busier than Tokyo Summerland on a Bank Holiday weekend in August and uglier than an ugly thing in an ugly competition in uglysville. I expect it to get hot in here. There's a lot going on in that watch. Way too much! should i get or should i not?! Busier than Tokyo Summerland on a Bank Holiday weekend in August and …Busier than Tokyo Summerland on a Bank Holiday weekend in August and uglier than an ugly thing in an ugly competition in uglysville. I expect it to get hot in here. 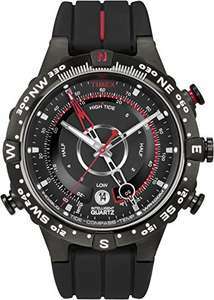 This is not a fashion watch, it has a specipfic purpose, great for surfer dudes and the adventurous. This is not a fashion watch, it has a specipfic purpose, great for surfer …This is not a fashion watch, it has a specipfic purpose, great for surfer dudes and the adventurous. Partly correct, they do need it for tides/waves, well done.